Gulls… we birders can’t live with them and we can’t live without them. The gregarious, opportunistic, adaptable avians of the family Laridae are never hard to find, no matter how far you are from an ocean, but can prove nigh impossible to identify definitively. The trouble with gulls, at least from a birding perspective (picnickers on the beach may have other ideas) is the apparent infinitude of basic, alternate, and formative molts and plumages most of these species exhibit during their lifespans. This extreme variability, while inspiring a degree of passion in some birders that results in mad excursions to winter seashores and junkyards, tends to intimidate most casual gull-watchers. Yet, with the right resource, even the subtle signs of gull speciation might be interpreted. 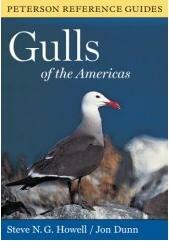 The Peterson Reference Guide to Gulls of the Americas by Steve N. G. Howell and Jon Dunn is just that resource. The Peterson Reference Guide to Gulls of the Americas is a remarkable work. This weighty tome could hardly be mistaken for a casual field guide. Instead, with over 500 pages and 1,160 photographs exploring the 36 gull species and 14 likely hybrids that appear in North or South America, this book may be nothing less than the authoritative text on its subject matter. The plates in Gulls of the Americas are brilliant, presenting in some instances more than twenty different photographs of a particular species in different plumages and molts. The decision to use photos rather than illustrations makes sense when a book can offer this many complementary views of a subject; more than 250 pages of pictures guarantees that just about every aspect of a given gull is represented. The plates also serve to excite the appetite, as it were. Moving through each group, from Masked Gulls to Small Gulls to pelagic Kittiwakes to Fork-tailed Gulls to the inimitable Ivory Gull, I found myself actually looking forward to going gull watching, and I hadn’t even cracked the Typical Gulls yet! The species accounts are also extraordinarily helpful, offering extensive detail on physical characteristics, field identification, and distribution. The range maps, large and colorful with the inclusion of arrows to indicate migration routes, provide more valuable information than I’m accustomed to. Though I’ve always been indifferent at best when it comes to gull chasing, I truly love the Peterson Reference Guide to Gulls of the Americas. In fact, acquiring it has dramatically increased my interest in the subject at hand. Simply the fact that this guide encompasses all of the Americas, covering every gull that breeds, migrates through, or even casually visits the New World, makes it a winner. Where some reference works take a narrow, North American view of avifauna, this one offers a broader vision; considering that the 36 gulls discussed constitute more than half of the 55 known species, Gulls of the Americas covers a big chunk of the world. All in all, this volume seems to have gotten everything right from the plentiful photos to the comprehensive accounts to the overall amiability and expertise of its authors. Ironically, though I may not currently possess the command of gull identification needed to identify minute flaws in the Peterson Reference Guide to Gulls of the Americas, with its assistance, one day I will! Oooh… I didn’t even know this was out yet. I’ll have to pick it up. Maybe it’ll give me an interest in gull ID too. I know those Jon Dunn videos didn’t help me any just because I got lulled to sleep.